Some assumptions are necessary here, before I get to my main point. Assumption No. 1: that, a few weeks back, a new president of U.S. Soccer was elected, Carlos Cordeiro by name. Assumption No. 2: that there really is a Carlos Cordeiro, that he is not a phantom, and from that comes Assumption No. 3: that he will at some point emerge from his hermitage long enough to tell us who he has chosen as the next coach of the U.S. men's national team. Assumption No. 4 is simply that one of the candidates for that post will be Jesse Marsch, and it is Marsch I want to talk about. As a candidate, he has some obvious plus marks: he is young, American, articulate, and he has grown up through all the various developmental stages of the American game -- from youth up to two caps for the national team. His pro career never hit the heights, though -- at age 24 -- he was a regular starter (under coach Bob Bradley) for the Chicago Fire -- an expansion team that had the audacity to win the MLS Cup in 1998. I never found him more than an average player, a bit too physical for my liking and with an irritating habit of quibbling with referees. His MLS coaching career (36 games in charge of the Montreal Impact, 135 games at the New York Red Bulls), has produced a Supporters Shield trophy with the Bulls (2015) and -- the same year -- an MLS Coach of the Year award. Statistically, that is not a particularly impressive record. But it doesn’t need to be. There is nothing in the history of soccer -- nothing that I’m aware of -- that says you have to have been a great player to be even a good coach. And there are plenty of examples of top coaches who were very minor players. Anyone recall Jose Mourinho as a player? Selecting a coach certainly entails looking at his record, but there are always other, more specific, more local, considerations that weight heavily. I would say that Marsch’s solid, life-long connection to American soccer is a very compelling point in his favor. Not that I would pick him. My vote would go to someone of similar American playing and coaching background: Jason Kreis. Simply because Kreis’s teams play the sort of soccer I admire, and Marsch’s teams do not. There are obviously two rather different approaches here. Kreis strikes me as more open and adventurous in his view of the game. Marsch -- well, I can boil my criticism of Marsch’s approach down to just one game played recently, the Red Bulls’ 3-1 win in Atlanta. A deserved win for Marsch’s Red Bulls. Yet a win that raises some big questions about Marsch’s approach to the sport. With barely 6 seconds on the clock we saw three Red Bulls racing up to gang-tackle an Atlanta player for the ball. Somehow, the ball was passed out of that scramble, up to another Atlanta player who was immediately knocked to the ground. There was no excessive violence or dirty play involved -- simply an immediate, unapologetic example of physical play -- with the Bulls perfectly willing to accept that (in midfield) a foul might be called. No foul was called. And the Marsch method -- highly energetic running, ultra-high (in this game) pressure continued throughout the first half. The main aim of such tactics is, of course, to unsettle -- even un-nerve -- the opponents. Did it work? I’d say that it did -- in the first half. But that was all that was necessary. Jeff Larentowicz -- too clumsy, too slow -- nearly made things a lot easier for the Bulls by getting himself red-carded early in the second half but he (and Atlanta) were reprieved by a VAR decision reducing the card to a yellow. No matter -- Bradley Wright-Phillips’s two goals soon followed and the Bulls had the breathing space to relax their frantic game somewhat. That was vital -- keeping up the running and the intensity that the Bulls maintained in the first half would have been asking a lot, probably too much. But Atlanta’s Greg Garza greatly helped the Bulls when he was red-carded in the 71st minute -- there was no VAR reprieve for this one. I’m not here concerned with the refereeing or the VAR decisions which were, on the whole, correct. What does concern me is a coach who is willing to sacrifice any notion of his team playing decent soccer because he’s determined to intimidate the opposition, or simply run them into the ground. Preferably both, I suppose. So: do I want to see the U.S. men's national team led by someone who prefers frantic physical hustle to intelligent, skillful soccer? Obviously not. But this is not merely a matter of my getting much more pleasure from watching the intelligent stuff. That the Bulls’ slam-bang stuff is unattractive to watch is a side-issue. What matters is that it is a hopelessly limited way of playing, totally devoid of any subtlety, and therefore incapable of any development. A dead-end in fact. Any “style” that is based entirely on the muscular output of the players is automatically limited. There are, after all, limits on how fast players can run, how high they can jump, how hard they can tackle and how long they can keep playing with such strenuous effort. The strain on the players involved is considerable. A consideration that is of vital consequence in tournament play, when games have to be played every few days, usually against experienced opposition. As in the World Cup. The Marsch method calls for heroic devotion to duty to make it work. The Bulls certainly gave everything they had during the first half of the game against Atlanta. Even when it didn’t matter, they evidently found it difficult to relax. This is evidently what Marsch wants. Seconds later, as the halftime whistle blew, he was on the field, feverishly congratulating his players as though they had just won something. The score at that point was 1-1. What is most depressing about the Marsch method is that his team has no place for a creative midfielder, a playmaker, a midfield maestro -- whatever he may be called, he’s not there. High-speed, high-pressure, high-tension soccer, in which your striker comes back to help out in gang-tackles, has no place for the creative player. Which would surely mean that Marsch in charge of the national team would be very bad news for such players -- who are of course most likely to be found in the growing ranks of the American-born Hispanic players. And, no, I cannot see any advantages to be found in that situation. 26 comments about "The Drawbacks of the Jesse Marsch Approach". Mark Fishkin, May 22, 2018 at 6:28 p.m.
"What is most depressing about the Marsch method is that his team has no place for a creative midfielder, a playmaker, a midfield maestro -- whatever he may be called, he’s not there." Paul, Kaku, New York's 23 year-old Argentinean midfielder currently leads MLS in assists. Theodore Eison replied, May 23, 2018 at 2:02 a.m.
s fatschel replied, May 23, 2018 at 6:51 p.m.
You would think after SA started charging, reporting quality would get better with deeper investigation and less assumptions. Wooden Ships, May 22, 2018 at 8:38 p.m. I agree with your assessment Paul. Overcoming a longstanding tradition that you’re referencing has halted development and selection. Style of play, such as this, has also been the mainstay of much of club and college soccer. It’s getting us nowhere. For too long, because we aren’t acquiring true-deft touches, dribbling and passing we then accept the more physical game. I want a coach/manager that has played with those skills and at a high level. No, not all former players make great managers, but I want their eye for technical, imaginative play. We have to demand that players representing this country all have real touch. Hugo immediately comes to mind, if we are sticking to someone that’s been in the US system and capped. Elizan Morales, May 22, 2018 at 8:54 p.m.
Mr. Gardner, I look forward to your next article: The non-Drawbacks of the Jason Kreis Approach. frank schoon, May 22, 2018 at 9:48 p.m.
Paul , great article, couldn't have said it better. Marsch's style of coaching is blasphemous to the development of American soccer , playerwise and soccerwise. 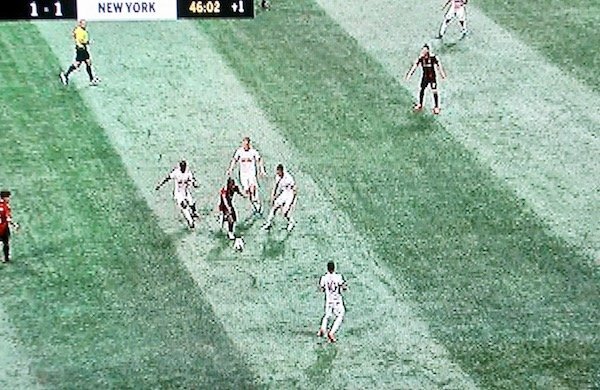 The object is to get the ball to Wright-Phillips and the rest of the team just runs around like pit-bulls trying to create havoc by forcing opponents little time on the ball with little space. They all run en masse with foam on their mouths. Yes, they have Kaku for they need someone that can actually pass the ball with a brain. Now here is the kicker, Marsch wil be successful playing this garbage style because due to the lower level of player quality in the MLS; the American players lack the thinking savvy and quick ball handling skills and quick movement off the ball to counter this onslaught. You can deploy this same strategy with a U14 team or even younger and you will be successful, but what will happen these kids will not develop properly. Good grief the East Germans could have employed this style of play. Atlanta has some good, savvy technical latin players who were doing just fine until the VAR and some of the calls changed the whole rhythm and psychology of the game. A team who relies on nice ball and tries to play soccer will be effected by these externalities, more so, than a team that doesn't play soccer, play even bad soccer, for their players are only required to go after the ball and pass it long up front to Bradley. A good team with players capable of fast ball handling skils and good in small spaces just play smart and allow the mindless idiots to run around untill they get tired. Marsche's tactic is fine when trying to change tempo, the tactics thus throwing off and surprising the opponents but you can't employ this as an your overall strategy. Bob Ashpole, May 22, 2018 at 10:49 p.m.
R2 Dad, May 23, 2018 at 12:16 a.m.
Alternately, Marsch is the perfect coach for the USMNT vs CONCACAF--he just needs to be fired after the Hex and the US has qualified for the next World Cup. He can play all the MLS guys and THEY can all get injured doing this headless chicken/college soccer thing. Phil Love, May 23, 2018 at 9:01 a.m.
Paul, on a different subject you love, I hope you saw the end of the FC Dallas v Vancouver game on Saturday. Penalty called on FCD GK for violently charging out to play a ball. Called in minute 7 of extra time! Tom G, May 23, 2018 at 5:55 p.m. I am far from the informed observer, but interested, so i ask with some reservation. Is the style of play his call or is it the style of play as dictated by the Red Bull international soccer system? Reading the recent interview with Peter Vermes, will USSoccer make up its mind about it's style of play and consistently applied it from top to bottom of the age groups? frank schoon replied, May 23, 2018 at 6:47 p.m.
beautiful game, May 23, 2018 at 6:28 p.m. There can't be a style of play when MLS squads for the most part are composed of a few technical players with solid soccer IQ, and a majority of less skilled players with a questionable soccer IQ. Add to that certain coaching practices of physicality/thuggery and the recipe for a style of play evaporizes. Bob Ashpole replied, May 23, 2018 at 7:10 p.m.
Thuggery is a style of play. Style simply means manner without a judgmental connotation. The manner in which a team plays need not be planned or intended. Mind you I am not advocating thuggery, but everyone who has played at a high level, even amateur, knows there is a physical aspect of the game that must be overcome for successful attacking play. If officials don't enforce the laws, games get even uglier. Right Winger, May 23, 2018 at 9:37 p.m. The sad part about this approach to this type of play is that it bleeds over to the DA teams that are part of the clubs that teach this nonesense. You see this ruff and tuff club play. The first option used by many club teams when they face a skilled player who is technically adept is not to defend against them but to take the player down at any cost. Why because the big team does it. Not the way the game is supposed to be played. We see it everyday in DA Soccer and US Soccer says nothing about it in an effort to quell it. Not only a bad way to play the game but contributes to injuries. Wooden Ships replied, May 24, 2018 at 12:51 a.m. Right Winger, you must be a throwback. Thanks. frank schoon replied, May 24, 2018 at 10:35 a.m.
RW, what scares me is that there are idiot youth coaches who see winning as their major goal will use this type of soccer at the detriment of the youth. And there are so many stupid parents who are more interested in looking for successful winning teams reagardless of how they play or develop their youth. Right Winger, May 24, 2018 at 9:57 a.m. Ships I am a Dinosaur. You know if these coaches and players want to beat themselves up at the pro level go far it. But what I see at the youth level which is a direct reflections of what the big guys do as it pertains to playing the game within the confines of the rules makes me sick. The officials could stop it. They don't. Thus I have to think US Soccer approves of these tactics which in my mind have a detrimental affect on the game. Right Winger, May 24, 2018 at 11:15 a.m.
Frank you are right on with the comment on idiot coaches only wanting to win. Sure everyone wants to win but not while sacrificing the safety of the players and the integrity of the game. I think that you and me are on the same wave length. Right Winger, May 24, 2018 at 11:21 a.m. I just read PG article again and a comment that really stands out is this type of play "leaves no place for a creative midfielder". Interesting comment because if you look at all of our youth national teams on the boys side( know nothing about the girls side) u14,u15,u16,u17 and all the way to the MNT we dont have a creative midfielder period. Our tactic is to run everyones tail off, chase the ball and hope we can out last the comepetition. Creative midfielders come along they are swept out to sea. frank schoon replied, May 25, 2018 at 10:08 a.m.
Bob Ashpole replied, May 25, 2018 at 11:32 p.m. This issue is why I am so interested in Cruyff's coaching in Spain and now Guardiola's coaching in Germany and England. Essentially both are exporting Dutch Style priniciples of play to foreign countries-different cultures--and doing it successfully at the top of the pyramid. It is not the Dutch Style priniciples that is the story, it is how you successfully apply them to a different country. Obviously my interest is in applying Dutch Style principles to US soccer. I am not sure anyone less than a soccer genius could succeed at such a difficult task. frank schoon replied, May 26, 2018 at 8:13 a.m.
Bob, this is an intersting topic. Wim Jonk who was appointed by Cruyff,as was Bergkamp, during the Cruyff Revolution in running Ajax's technical side of Development of the club, was interviewed last year after leaving Ajax a little over a year ago. Wim Jonk was the head man in bringing over and applying Cruyff's ideas of how the Ajax players should be developed. The interviewer ask Jonk, if Cruyff talked alot about the 4-3-3 system. Jonk stated, "hadly ever,but what Cruyff talked and stressed the most about are the PRINCIPLES (those followed by Cruyff) of soccer that needed to be taught. Cruyff saw so much of what he learned as a player and what made his teams so great, those principles being watered down over the years as a result making the players and soccer not as good. No matter country, or what style the play, it is all about the PRINCIPLES that need to be adhered to. This is why Cruyff was successful in Holland with Ajax, but also with Barcelona, as Guardiola was/is successful with Barcelona, Bayern, and Man City ,different teams ,different countries. Dave Wolf, May 24, 2018 at 2:44 p.m.
Two thoughts to begin: First, I am unashamedly pro "latin" when it comes to my football tastes, especailly Argentine. In my opinion, you can make a compelling argument that Argentine football should be, at the very least, taken seriously as a model for how the US should consider implementing a "style" of play (if in fact that is even possible with a country of our size). Secondly, I'm tired of Paul Gardner. I think his reporting is lazy and he is dreadfully underappreciaitive of how both difficult and subtle the game of football is. I thought the NYRB/Atlanta United game was excellent. I would love for my college team to play, stylistically, like BOTH teams, but especially NYRB. I like Jesse Marsch as well, and somewhow Tata Martino (who I also greatly admire) gets let off the hook. Atlanta United did plenty of chasing and pressing, but if you are Latin and once coached FC Barcelona, I suppose you get a pass (?) The conclusion of the first half was wonderful, with 3 NYRB players closing, intelligently I might add, around Darlington Nagbe, one of my favorite players. A combination of effort, intelligence, and real commitment to being a team. Lastly, if Mr. Gardner can't find the qualities of Kaku in that game well, Soccer America, you've got some work to do with your staff. Maybe it doesn't look the same a Miguel Almiron (with his wonderful forward runs and attacking dribbles), but Kaku plays forward (simply, most of the time), is clever, pops up all over the field, and plays with genuine passion. You actually have to know something about football to see it. Perhaps SA can consider employing a staff of writers who, first and foremost, actually role up their sleeves and work and, secondly, who try and keep pace with what is happeing in football today. Bob Ashpole replied, May 24, 2018 at 10:43 p.m. I think the Mexican MNT plays (or at least has played) a very good, successful, updated interpretation of the old Argentina 352 system, but with no playmaker. It, however, seems very direct depending more on flooding zones with runners rather than good positioning and movement. frank schoon replied, May 25, 2018 at 10:22 a.m.
Fire Paul Gardner Now, June 20, 2018 at 10:22 a.m.
Just saw this flaming pile of garbage. Counterpressing is a tactic used all over world soccer, including some of the biggest clubs in the world. What is this guy babbling about?